This was originally written for pediatricians who are represented by www.HealthyChildren.org – with a few additions for this blog post. If this is so, then I would respectfully suggest that this organization refrains from recommending foreskin retraction and circumcision. Neither contributes to “the attainment of optimal physical, mental, and social health and well-being for all infants, children, adolescents, and young adults.” In fact, there is quite a bit of evidence that retraction creates a host of iatrogenically induced problems, that can lead to a “need” for circumcision – and circumcision can be detrimental to “the attainment of optimal physical, mental, and social health and well-being for all infants, children, adolescents, and young adults. Plus, an adult retracting a child’s foreskin could rightfully be interpreted as a sexual assault, as can circumcision itself. The child does not know why adults are touching his private parts and cutting on them. It is highly understandable that the young mind can see circumcision as sexual abuse. The details of the memory might be clouded but the body never forgets. Most circumcised men are reminded something is wrong every time they go to the bathroom or attempt to have sexual relations. They never achieve the point of ecstasy they know they could and should. They know something is wrong, very, very wrong. But their expressed concerns are often scoffed at by trained professionals, who are perhaps themselves circumcised and therefore in denial of their own condition, or embarrassed to address the subject of genitalia. Not all who were circumcised realize they were cut and very few get to the point of healing the PTSD they’ve carried from infancy. Many of the aware yet still unhealed are those you see demonstrating at medical conferences with bright red circles at the crotch of their pure white suits. The “aware that they are circumcised but still unhealed” men – and women – are for the most part angry that they were hurt as children and angry that as adults they do not have the full natural, functional bodies they were born with. It also pains them that even to this day, children are still being subjected to unnecessary cosmetic genital surgery. It pains me too. And I fully understand their grief. Sorrow expressed by the unhealed often looks like anger and rage. I pray you listen, hear, look, see, and let this message into your hearts. Begin treating birth as the amazing, awe-inspiring wonder that it is, women as human beings worthy of respect, and the children they bear as conscious beings who deserve protection, love, care and “the attainment of optimal physical, mental, and social health and well-being.” – not just slabs of meat. I am sorry if you too were hurt by circumcision as a child, but the lesson to learn from our own misfortunes is to never treat another as you were treated when you were hurt. To pass on the abuse is a failure to learn the lesson. If you think circumcision is a valid medical procedure, you are among the wounded. 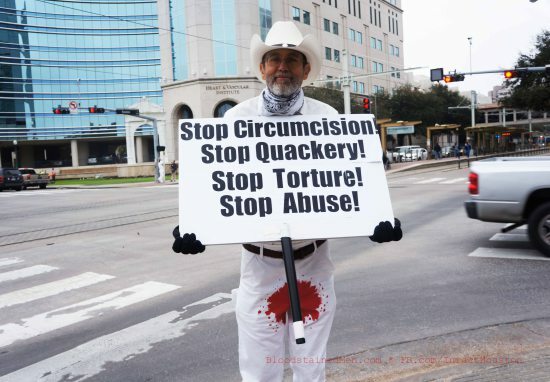 A cursory objective investigation would serve to convince the adult in you that circumcision is – quite frankly – medieval torture and has no place in a civilized world. Previous PostPossible EQ March full moon 2019?